Remington UMC, the name American's trust. For the last 150 years, the Union Metallic Cartridge Company's name has been synonymous with innovation and quality. UMC has become a permanent fixture in shooting ranges and hunting grounds in American because UMC delivers the best shot-to-shot consistency and always has the latest technology at the right price. Simply put, UMC delivers a better product more efficiently, and the results are proof. From point of purchase to point of impact. This Freedom Bucket, 160 rounds ammunition of .300 AAC Blackout, is filled to the brim with quality factory-fresh brass. This ammunition has a clean-shooting Kleanbore primer and powder blended for consistent velocity. Remington UMC ammo is proudly made in their Lonoke, Arkansas manufacturing facility. How many to get free shipping? What type of Bullet? Fmj or Hollow point? Hollow Point. Very small open tip. No issue for AR type semi-auto. Does anybody ever ask a question that is NOT covered by the written description already? BEST ANSWER: Who cares, I read them for a good laugh. Is this ammo subsonic or supersonic? Brass, steel, or aluminum cases? BEST ANSWER: Brass. R-P stamped. Good reloadable cases. what is the lot number on this ammo? a lot number is an id tracking system to find all the ammo in a specific lot, if there is a problem with the batch of ammo. so problem can be corrected. Has anyone reloaded this brass? Is subsonic available on this deal as well? Picked up a bucket today. Loaded up 2 30rd pmags and counted out the rest. I was bummed. Only 99 in left in the bucket. When I stood up there it was. The golden 100th bullet. Wow. Happy Easter to me! All 160 accounted for! Can't beat the price on this ammo. Good Price to Take the .300 to the Range - Freedom Bucket! Nice ammo. Exactly 160 rounds in my Freedom Bucket. The brass is stamped R-P, not Barnes as some have stated in their reviews. It's a Freedom Bucket. How can that be bad? They are now remington peters brass. No more barnes brass, but I did get 1 extra. Bonus! Just got my two buckets in today. 160 in each, I counted them twice . Yep, mine is Barnes ammo. 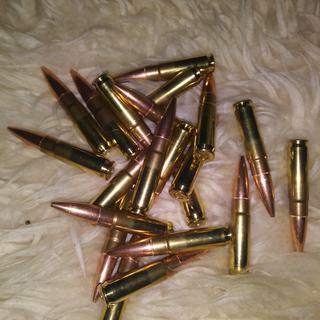 Put 300 into one bucket an got the second one for empty brass. The remaining 20 are loaded in a new blue anodized magazine. I'll test both at the same time. Can confirm they are Barnes. Exactly 160 rds in the bucket. Remington 160 round count bucket contained only 130 rounds. I counted them because the bucket was 1/2 empty and that looked strange to me.